The pomegranate, considered one of the most powerful, nutrient-dense foods for overall good health, is a must-have fruit for the fruit basket in any household. Its popularity and virtues go as far back as antiquity, functioning as an important symbol in ancient cultures, religion, and sacred text. 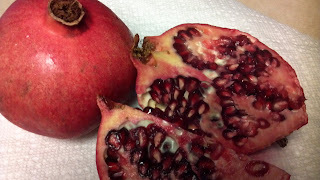 The ancient Greek traveler and geographer, Pausanius is noted for making the following statement: "About the pomegranate I must say nothing, for its story is somewhat of a holy mystery." This extremely delectable and delightful fruit has long been considered a symbol of love, fertility, fruitfulness, abundance, and good luck. Laboratory research and clinical trials suggest that pomegranate juice may be effective in reducing heart disease risk factors and in inhibiting viral infections. Also called the fruit of the dead in Greek mythology, this life-enhancing fruit of paradise is a part of my diet every other day in the week. This was a fruit that I used to eat as a child and which I found delicious unaware, of course, of its wholesome properties. Now as an adult, I find the seeds quite challenging and the bottled juice too acidic. I guess I need to eat what is salutary despite the little inconveniences. Thanks for posting. Thanks for taking the time to read my post and also for your response. I tried the bottled juice, but I also found it too acidic. My girlfriend and I have found a way to make good use of its benefits. We bought a juicer and we like to juice the seeds and its red fleshy covering (one pomegranate) along with carrots (6), granny smith apples (2), beets (1), pineapple slices, and (4-5 slices skin and all). I also add a celery stalk to mine. My girlfriend does not like the celery in hers. We drink the resultant juice every other day. She calls it her "blood" :-) But I would surely recommend your getting a juicer. Plus you can also use it for juicing other stuff.